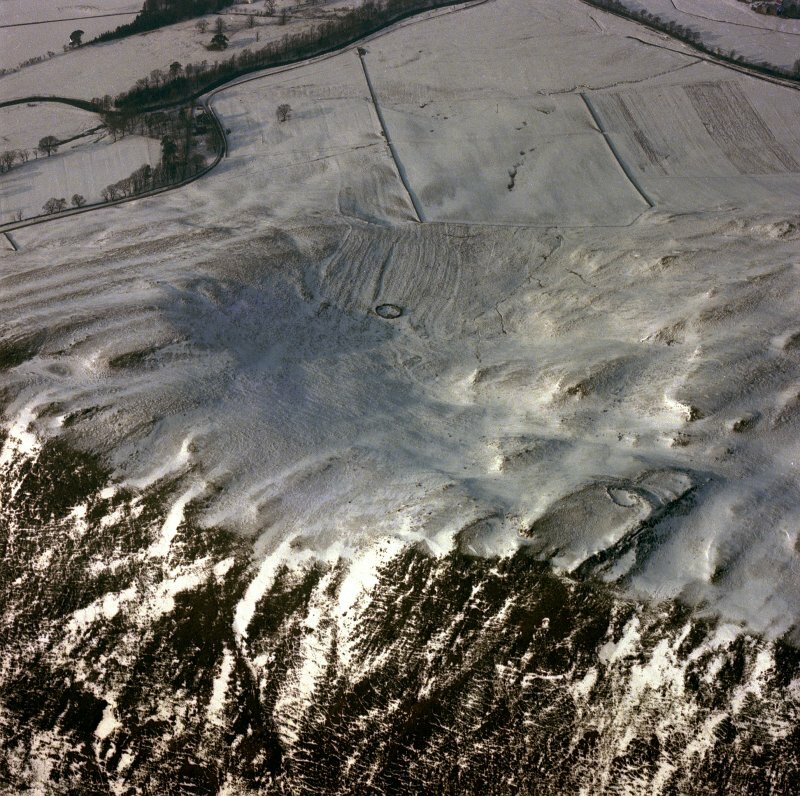 Oblique aerial view of Cademuir fort under snow, looking ENE. 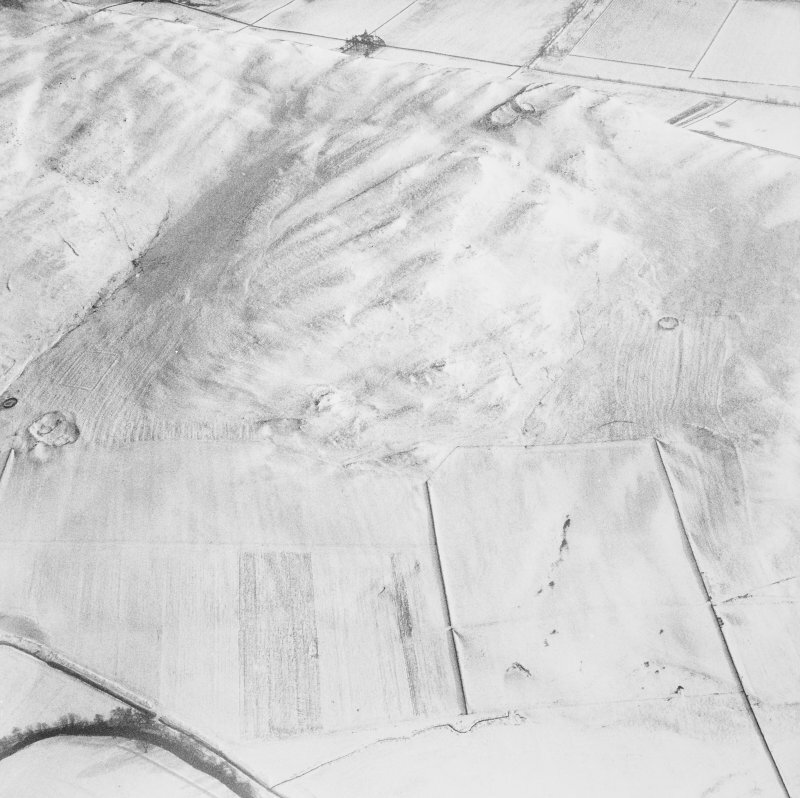 General oblique aerial view of Cademuir forts, and cultivation terraces under snow, looking NE. 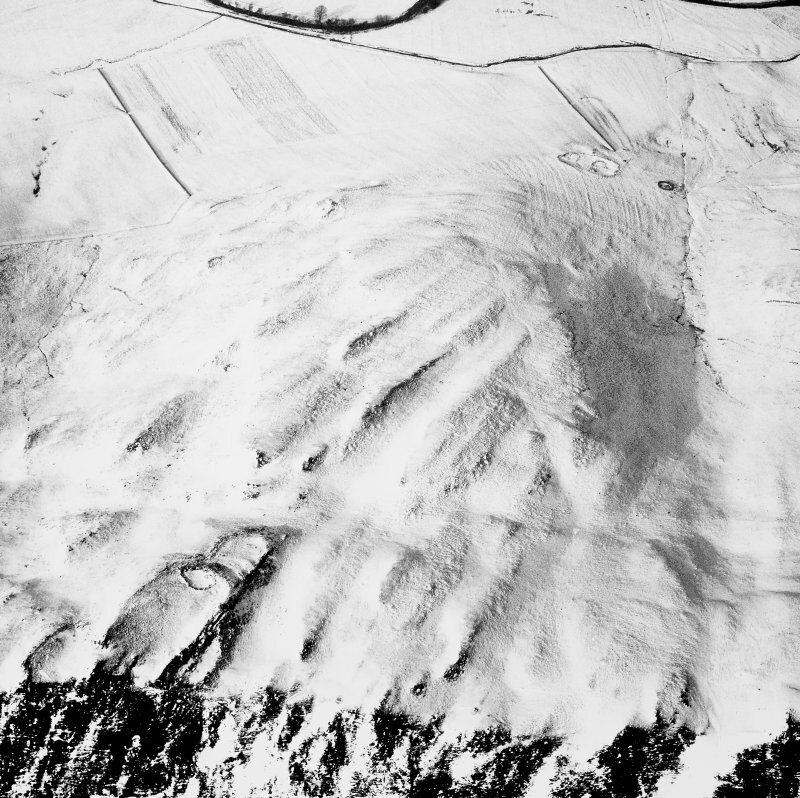 General oblique aerial view of Cademuir forts, and cultivation terraces under snow, looking ENE. This fort is situated at a height of 1050' OD on a rocky knoll at the SW end of the elongated summit of Cademuir Hill. It is a little under half a mile SW of No.263, and 250' below it. A very steep slope affords the site great natural protection on the SE, but the ground is only moderately inclined on the SW and NW, while the approach from the NE is over level ground. 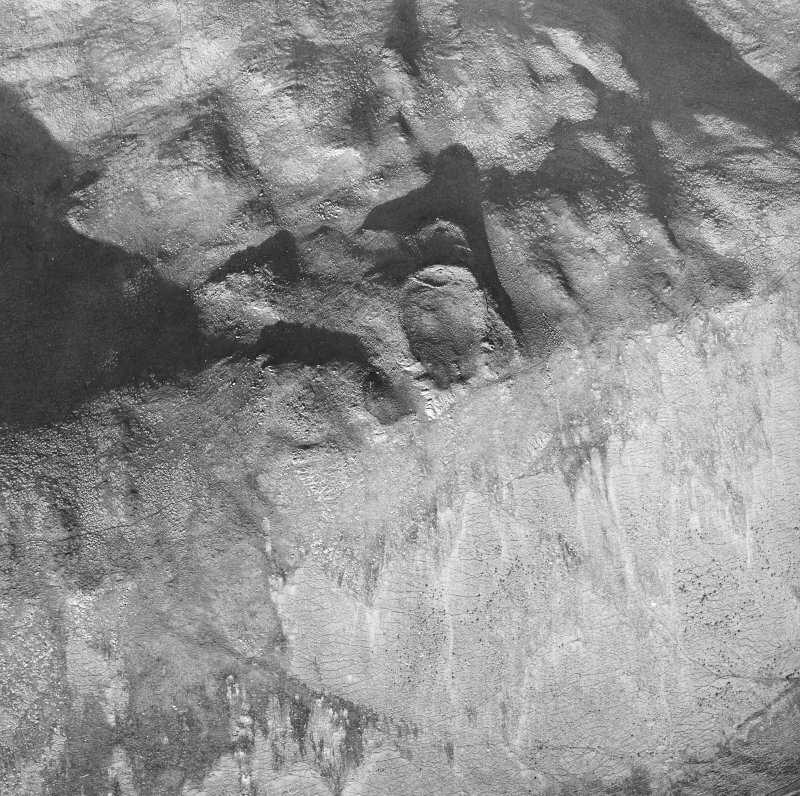 The fort measures 240' by 120' within a stone wall (A), the debris of which has formed great scree-like deposits on the flanks of the knoll. 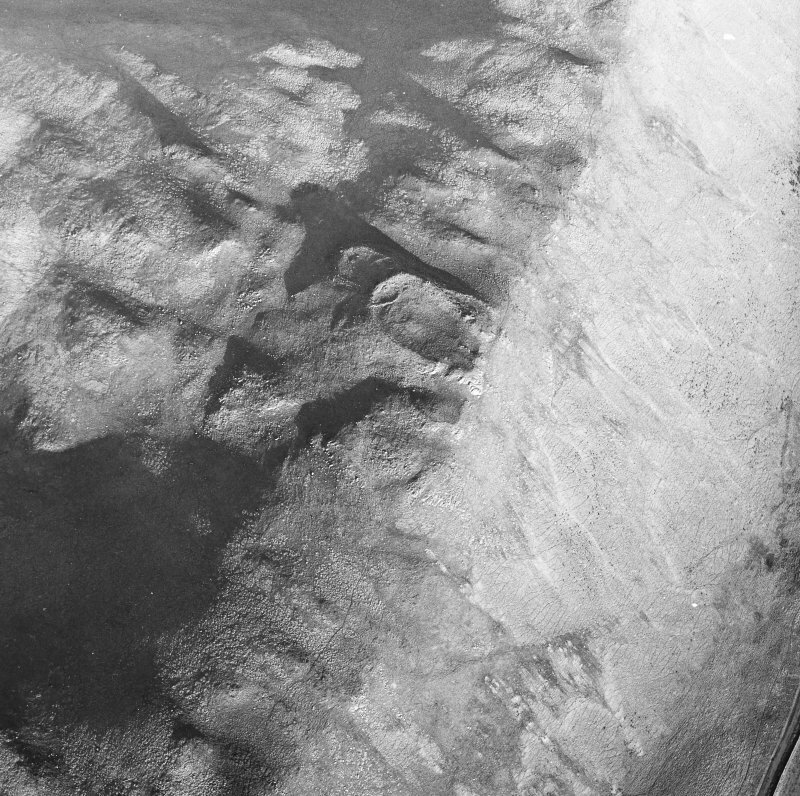 Stretches of both faces are still visible in situ on the E and indicate that on this side the wall originally measured about 20' in thickness: on the other sides, where the flanks of the knoll provide some protection, it was probably substantially narrower. The position of the entrance is indicated by a steep-sided rocky bay near the southern end of the W flank of the knoll, access to which is gained from a natural terrace some 12' below. The terrace is bordered by a stone wall (B) which is likewise represented by a mass of fallen debris. There is an entrance at the N end and several facing-stones are visible on either side of the gap. A smaller natural terrace on the opposite side of the fort is also bounded by a ruined stone wall (C), but in this case no communication seems to have been provided between the terrace and the interior of the fort. Immediately to the N of the fort there is a third natural terrace, which is crossed by some slight remains of a stone wall (D). This wall was superseded in due course by another wall (E) which en- closes the whole of the terrace and overlies the ends of wall D. Several of the visible facing-stones of wall E are set on edge, and not on bed as in walls A, B and C. Again, there is no indication of a gap in wall A through which access could have been gained to the northern terrace. To the NE the knoll is bordered by a gully, 10' deep and 120' wide, on the far side of which there are the remains of chevaux de frise. Although it is clear that a good many of the stones forming this have been removed or fallen away, more than one hundred still remain earthfast over a distance of 260' measured from the brink of the steep S face of the hill. 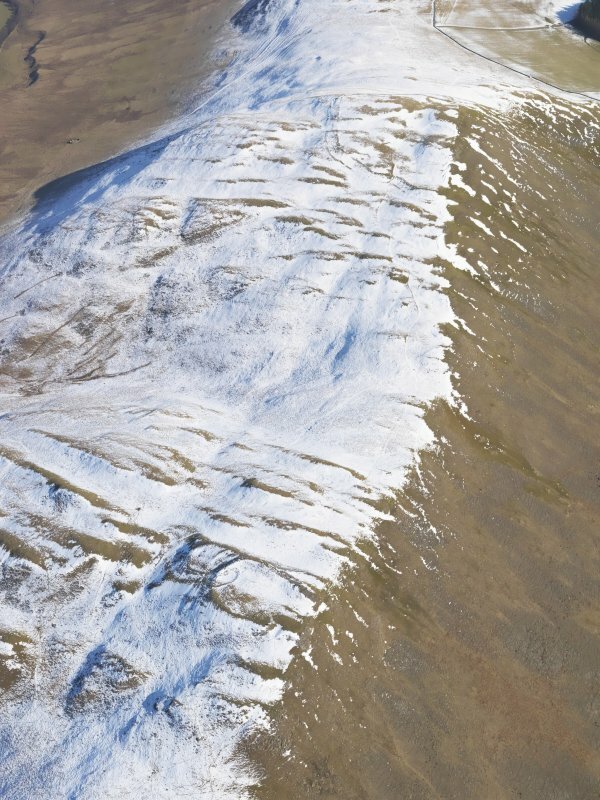 The position of the obstacle is such that it would have been invisible to an attacking force advancing from the NE until they breasted the flank of the gully and were among the stones. 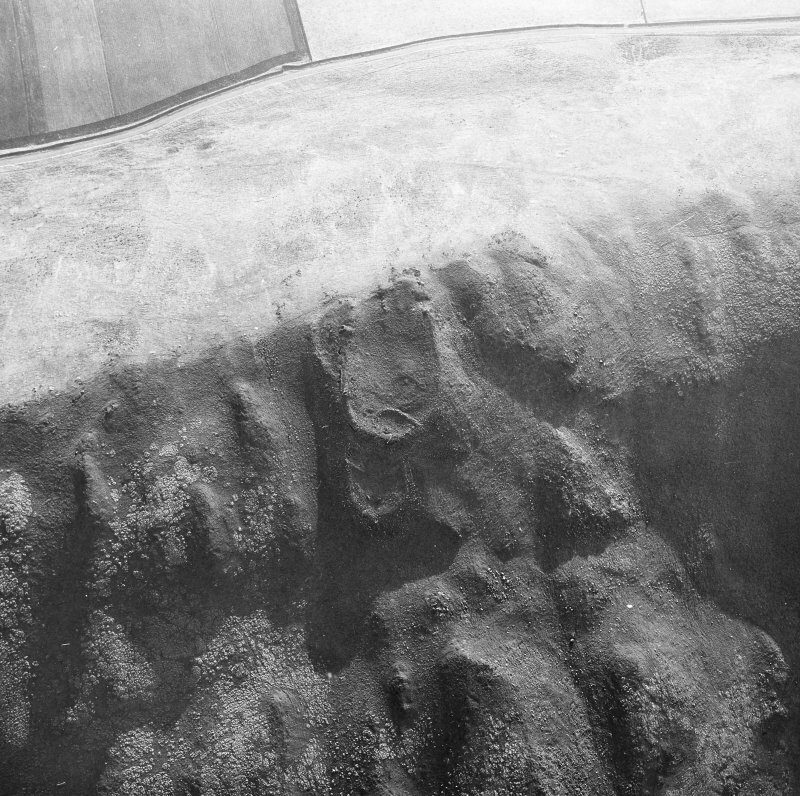 The interior of the fort, which is under fine pasture, contains the surface traces of one ring-groove house, measuring 40' in diameter, and a crescentic scarp which may mark the site of another. A ruined sheepfold overlies the N end. The hills of Cademuir are a natural stronghold, bounded by the Manor Water and the Tweed, and by a former broad meander of the Tweed, now a flat and cultivated valley. 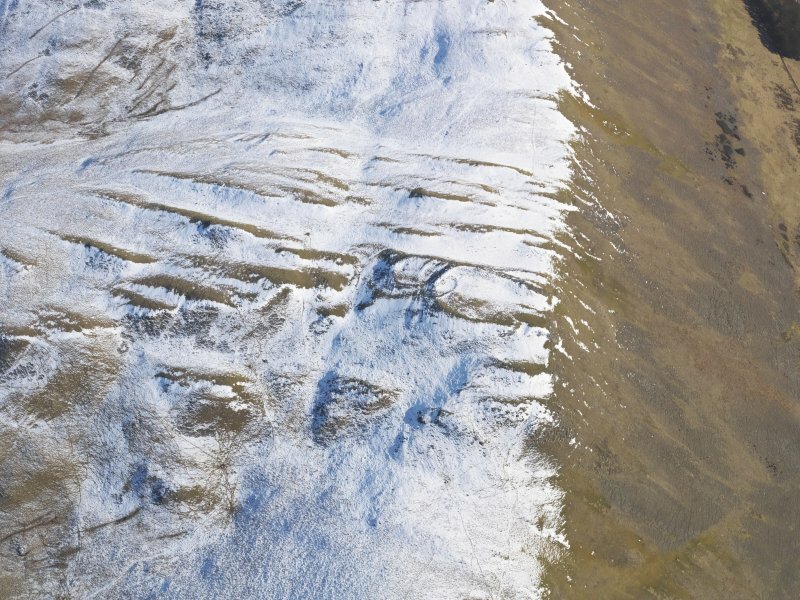 Traces of hut platforms (NT 233381) and a scooped homestead (NT 234382) survive on the lower north-west slopes if the hills; whilst on the saddle (NT 237380), 485m west-north-west of the main summit, on level ground, there are traces of platforms for two timber houses and a secondary stone-walled house within what is now simply a low stony bank. 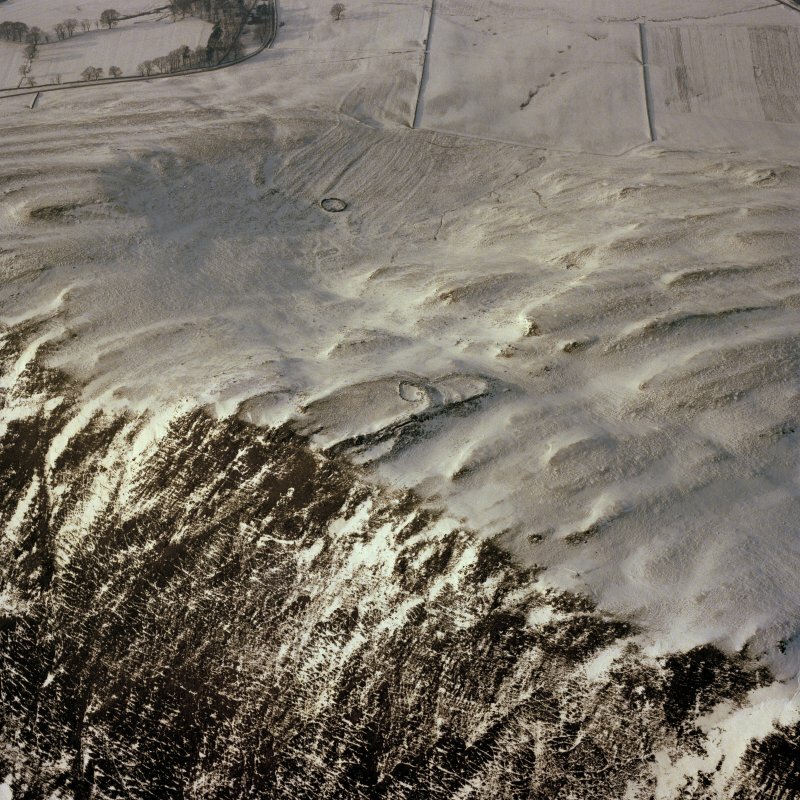 The two fortified settlements lie on the ridge to the west Cademuir I stands on the summit of this ridge with good natural protection on all but the slightly less precipitous south-west side. Some 2.25 ha are enclosed by a single 3m thick wall, faced either side with stone and infilled with rubble. The original entrances are to the east and to the south-west, and except to the southeast the wall is surrounded some 6m-12m away by an unfinished rampart. There are traces of at least 35 timber-framed houses within the fort, identified by circular grooves in the ground-and space for as many again. Most are about 7.6m diameter. This suggests a site of some significance in the earlier iron age, and of more than local significance. It was, in fact, a small town but since there are no traces of stone-built houses or other secondary structures, it was probably abandoned cAD 80 after the arrival of the Romans. The second, considerably smaller fort, occupies the lower western summit of the same ridge. Outside the massive stone ruins of its 6m thick enclosing wall, subsidiary enclosures stand on terraces to the southwest,south-east and north. Its most interesting feature is undoubtedly the chevaux de frise protecting the north-east approach over level ground (cf Drevano. 87). 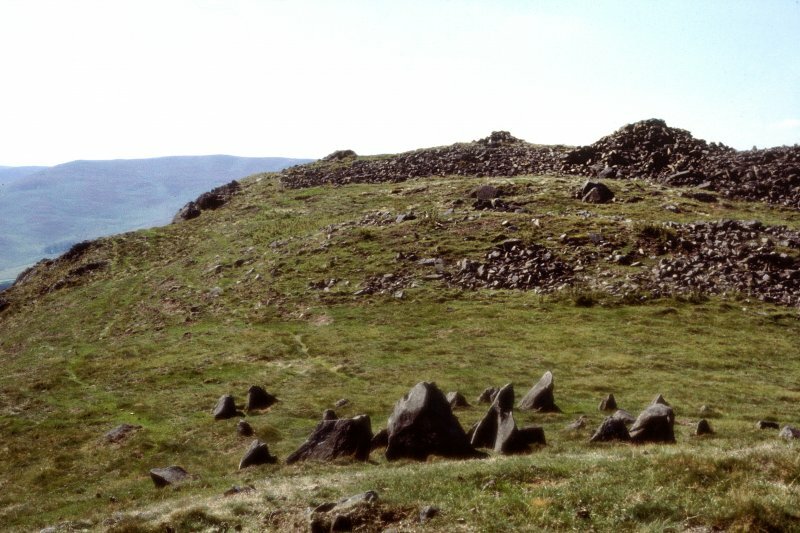 More than 100 stones still stand over a distance of nearly 80m, set in the outer side of a small gully so that they would have been invisible until attackers had breasted the gully and were in amongst the stones. Sudden disarray! Both sides of this crucial Tweed Valley-Upper Clyde through-route are peppered with fortified hilltop settlements. 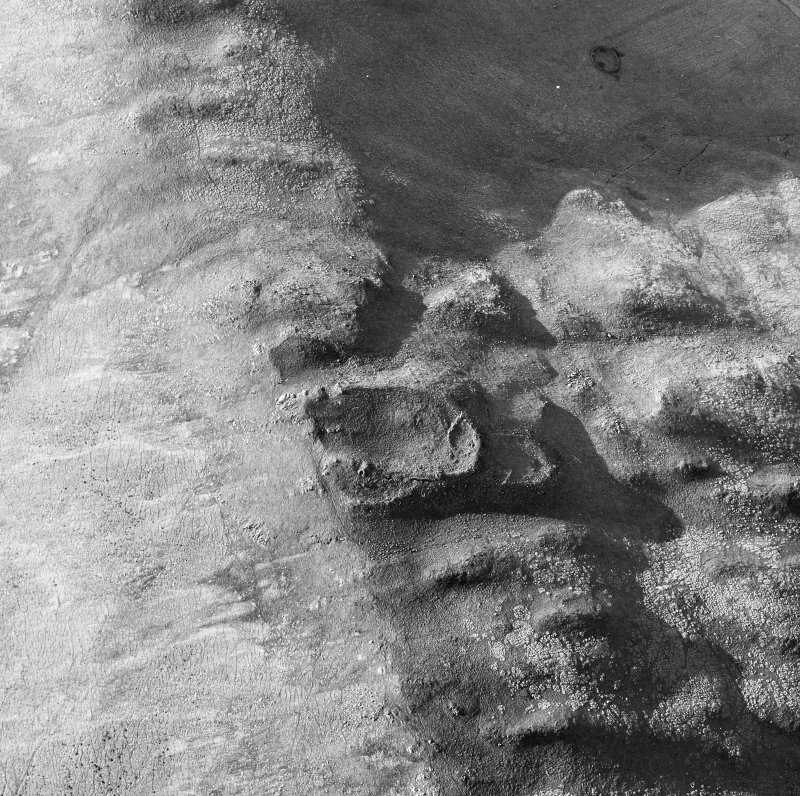 About 3km north-west lies white Meldon (NT 219428), the largest A little to the west Hamildean Hill fort (NT 187419) was never completed, pe:r:haps on account of the arrival of the Romans; a further 4.5km north-north-west Whiteside Hill fort (NT 168460), above the Romanno cultivation terraces (no. 22), is particularly well-preserved and conspicuous. 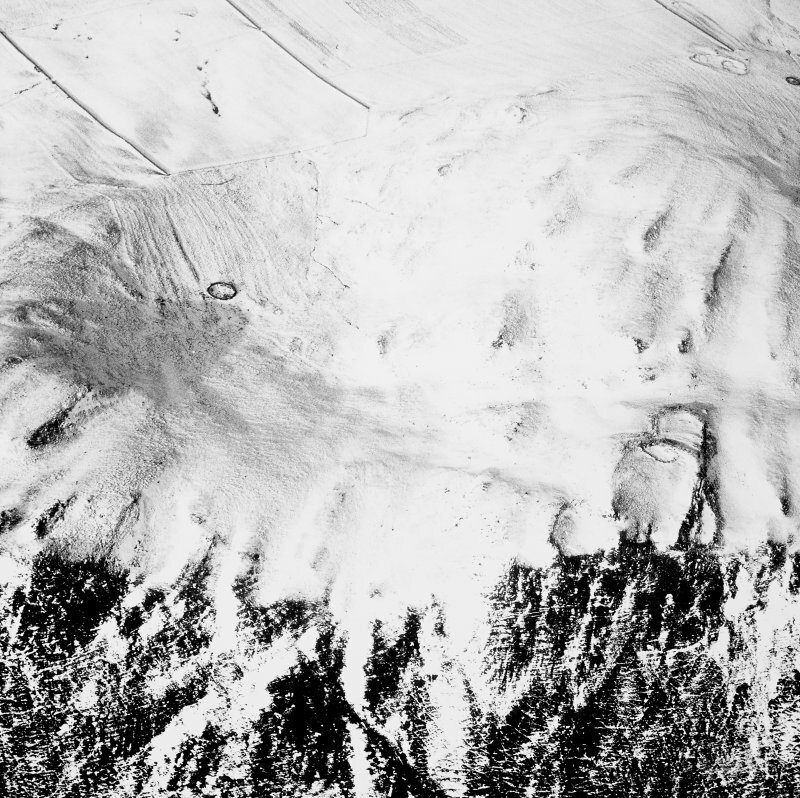 This fort, one of two in in the district incorporating chevaux de frise into its defences (see Atlas No.3577), is situated on a rocky hillock forming a local summit on the WSW spur of the Cademuir ridge. The position exploits the ribs of outcrops and intervening gullies that cut across the spine of the ridge, combined with the steep escarpment that falls away on the SSE in long screes to the very bottom of the valley over 100m below. The main defences comprise a roughly oval enclosure measuring internally about 73m from N to S by 36m transversely (0.23ha), and an outer enclosure embracing its entrance on a lower terrace on the WSW, but there are also outer walls on the E and and N, the latter forming what appears on plan as a small annexe, but without any entrance and apparently isolated from the interior of the fort. 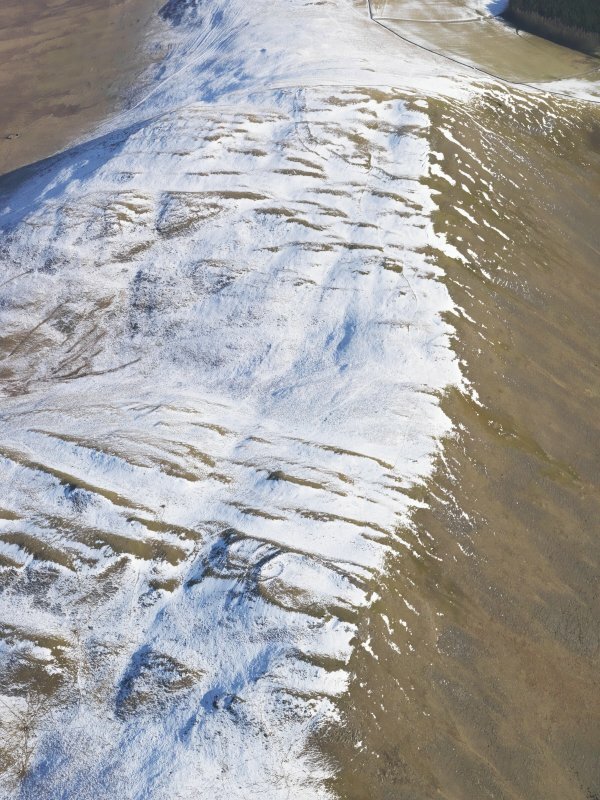 The wall along the E flank is particularly massive, measuring some 6m in thickness, not only dominating an outer wall which extends along the lip of a terrace before disappearing northwards into the general scree of rubble, but also the chevaux de frise set on the reverse slope of a shallow gully beyond it. The general scree of rubble, and indeed the chevaux de frise, extends well beyond the point where the main wall returns across the N end of the hillock, indicating that the wall of the annexe has also been of some size on this side, though a rampart reduced to a terrace cutting across the interior of the annexe from E to W also suggests that it is a modification of an earlier outer defence on the N. The main wall on the W does not appear as thick, possibly because no facing stones are visible along its line, but the mass of fallen rubble lying at the foot of the slope demonstrates that it was a substantial structure. The outer enclosure protecting the entrance springs out of this rubble, and the facing on the E side of the entrance through its N side survives in place; from here the approach to the entrance on the WSW of the main wall doglegs up a steep some 4m high. Within the interior, the N end of which has been adapted to create a sheepfold, there are traces of two ring-groove timber round-houses.